Sadati firoozabadi, S. (2015). Investigating the factor analysis, reliability, and validity of the multidimensional student’s life satisfaction scale. International Journal of Behavioral Sciences, 9(1), 71-75. Somaye Sadati firoozabadi. "Investigating the factor analysis, reliability, and validity of the multidimensional student’s life satisfaction scale". 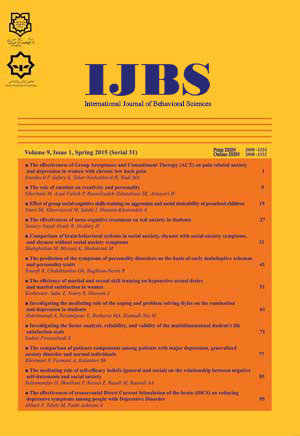 International Journal of Behavioral Sciences, 9, 1, 2015, 71-75. Sadati firoozabadi, S. (2015). 'Investigating the factor analysis, reliability, and validity of the multidimensional student’s life satisfaction scale', International Journal of Behavioral Sciences, 9(1), pp. 71-75. Sadati firoozabadi, S. Investigating the factor analysis, reliability, and validity of the multidimensional student’s life satisfaction scale. International Journal of Behavioral Sciences, 2015; 9(1): 71-75.